These wipes are my favorite of the wet wipes i have used till now. These come in a pack of 10 wipes (occasionally i found packs with more number of wipes too) and are extremely moist and wet. Smell heavenly in citrusy lime, these are easy to carry around too. For someone with sensitive skin and nose too like me i found these so very pleasant not to forget they do a pretty good job at removing the makeup!! Though for makeup removal, i particularly pick Himalaya Wet Wipes; Clarus wipes are good too. Can find these in any local Supermarkets, esp Ratnadeep Supermarket. I need to have 1 pack in my handbag always. These wipes instantly soothe and calm my skin which often gets red when am out in Sun. Priced at 27 INR for 10 wipes, i find them a good deal for money. These are refreshingly cool with a lingering fragrance. And have a gentle moisturizing effect with mild anti-bacterial action. Do i need more to say why i love these??? What's your favorite Wet Wipes? 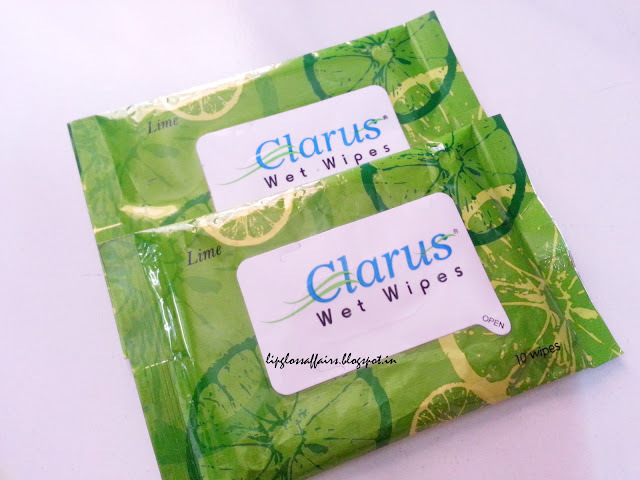 Have you tried Clarus Wet Wipes in Lime ? ?